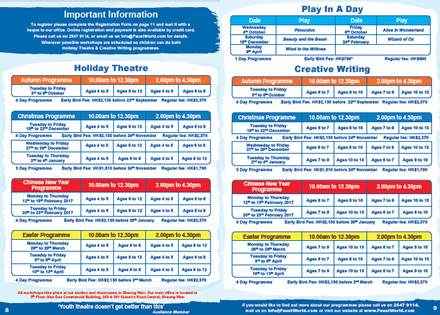 We now offer Creative Writing all year round with our term time programmes in addition to our holiday creative writing programmes! Our Term-time creative programmes runs on Saturdays for ages 6 to 13 and aim to give students a dedicated time every week to focus on their writing, to share their ideas and to learn new techniques. Workshops will take place at the Faust studio in Sheung Wan. Our four-day holiday creative writing programmes are available during the autumn, Christmas, Chinese New Year and Easter holidays. Please click below for our brochure and schedule. To reserve your child’s place for our term time programme, please click here and enter your details and information. To reserve your child’s place for our holiday programme, please click here and enter your details. We offer holiday creative writing programmes all year round during the Autumn, Christmas, Chinese New Year, Easter and Summer holidays. These run either in the morning from 10.00am to 12.00pm or the afternoon 2.00pm to 4.00pm. Our Creative Writing workshops are for ages 6 through to 13 (different age groups are available at different times) and take place at our offices in Sheung Wan. 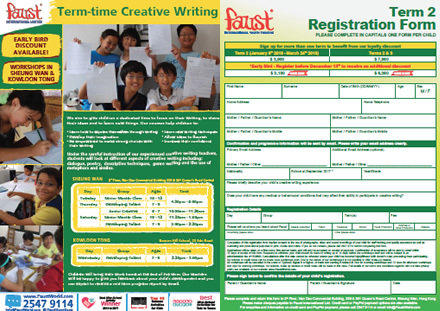 During the school term, we offer term time creative writing workshops for ages 6 through to 13, which take place in Sheung Wan. 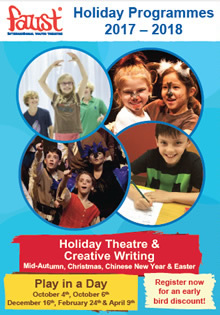 In addition to our creative writing workshops, we also offer Holiday Theatre and Play in a Day! For an example of our Creative Writing classes, please click below. Content of each lesson is tailored to the needs and ability of the class and the below is for reference only. Ages 6 Ages 7 - 9 Ages 10 to 13 We also offer Holiday Theatre click here! Content of each lesson is tailored to the needs and ability of the class and the above is for reference only.